The marsh flux tower in spring 2005. In 2005, a marsh tower flux site was added as part of the former Fluxnet Canada Research Network at the Mer Bleue wetland complex near Ottawa, ON. This marsh was created approximately 50 years ago because of the road development adjacent to the wetland. This anthropogenic disturbance is typical in many areas with many constructed wetlands taking the form of marshes. Unfortunately, limited knowledge of carbon exchange and storage potential exists in this “wet” end of the wetland spectrum. 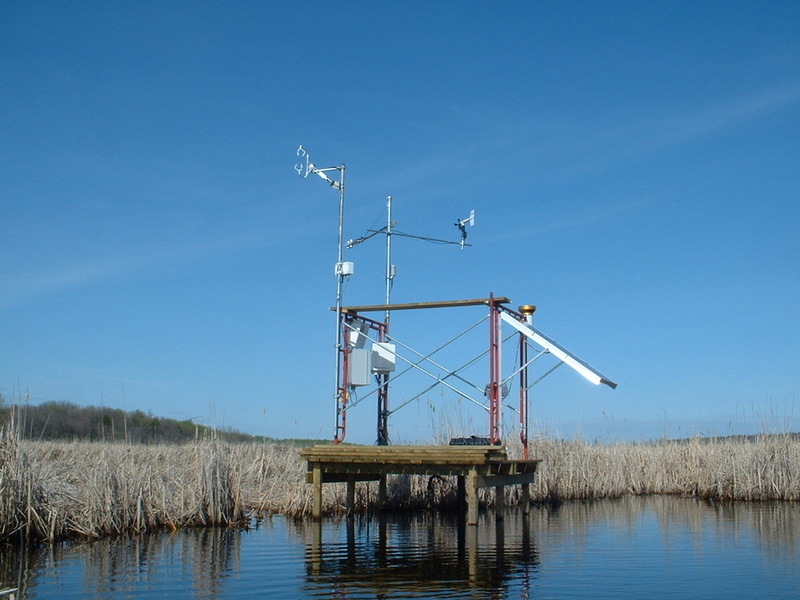 This NSERC-funded research supported by the Canadian Carbon Program featured semi-continuous measurements of net ecosystem exchange of carbon made from this cattail marsh site from May 2005-2009 along with chamber-based measurements of methane from both the open water and cattail portions within the summer months. The site was re-started in summer 2017 with the addition of continuous eddy covariance methane measurements. (NEE) at the marsh was an uptake of −224 ± 54 g C m-2 yr-1 (multiyear mean ± SD). To date, methane has been measured using chambers on the dominant cover types (plants; mats; open water) and when weighted by area, the net ecosystem CH4 emission is 127 ± 19 g C m−2 yr−1. This leaves a net carbon uptake of −97 ± 57 g C m−2 yr−1. The marsh is also estimated to be a small net exporter of dissolved organic carbon although measurements are difficult as the inflow and outflow are diffuse in nature. With over 50% of the CO2 taken up by the ecosystem returned to the atmosphere as methane largely through plant mediated transport, it is essential to have better ecosystem scale measurements of CH4 emissions. Bonneville, M.-C., Strachan, I.B., Humphreys, E., and Roulet, N.T., 2008. The net ecosystem exchange of a cattail marsh in Eastern Canada in relation to biophysical properties. Agricultural and Forest Meteorology, 148: 69-81. Stephanie Crombie 2012. “The carbon and energy budgets of a marsh ecosystem” 116 pp. MSc thesis, McGill University. Marie-Claude Bonneville, 2006. “Measurement and modeling of surface-atmosphere exchange of CO2 and CH4 in a cattail marsh in Eastern Ontario” 144 pp. MSc thesis, McGill University.